Boom 111,3 m to 52,0 m six section TWIN-LOCK™ boom. 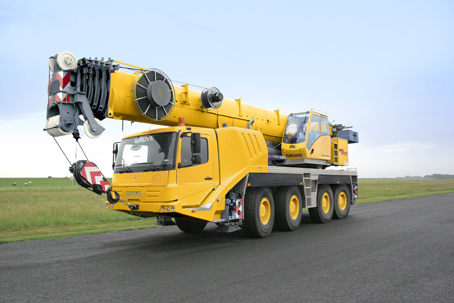 Maximum tip height 55,0 m.
Engine Mercedes-Benz OM 904 LA, diesel, 4 cylinders, water cooled, turbocharged, 129kW (175HP) at 2200 rpm. (80/1269 EWG - fan rigid). Max. torque: 580 Nm at 1200-1600 rpm. Fuel tank capacity: integrated in carrier fuel reservoir. Engine emission: EUROMOT / EPA / CARB (non-road). • Lattice extension, 27 m - includes 2x5 m fixed non-offsettable sections plus10/17 m swingaway (see above). Cab Aluminium, 2-man-design, safety glass, driver seat with pneumatic suspension, engine-independent diesel air heater incl. 24 h timer. Complete instrumentation and driving controls. • 8 tyres, 525/80 R25 (20.5 R25) - Vehicle width 2,88 m.
• Engine Tier 3: Mercedes-Benz OM 460 LA, 295 kW, max. torque 1900 Nm at1300 rpm.